Constance had an adventurous spirit, but was it adventurous enough to make a life with Ryder Jones? His country speech bordered on barbaric (at least in her eyes) and his isolated way of life out on the Prairie scared her to death! Would she ever see her sisters again? How could she possibly adapt to living with such a man? Ryder had seen his share in his 26 short years. Orphaned at nine, raised by Indians, he held to their way of life for as long as he could. But circumstances forced him and his brother to return to the ways of the white man and seek out a new life, one that included a wife for each of them. But neither was prepared for the kind of woman they got when they decided to send away for mail order brides! Eloise was the least adventurous of her sisters, and thought she wanted a life of peaceful serenity alongside a quiet man, one civilized and genteel. But did she know herself well enough to stick to her own assumptions? Yet alone, the man she was going to marry? 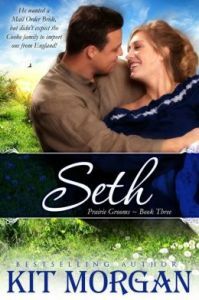 Seth Jones gave the appearance of a dutiful, yet bumbling hotel clerk, while his brother Ryder was considered the rugged hero, one who’d saved his wife and himself from death. How could Seth compare to that? Worse, how could he allow his future bride to know he’d done things, things that would probably make her scream and run the other way? 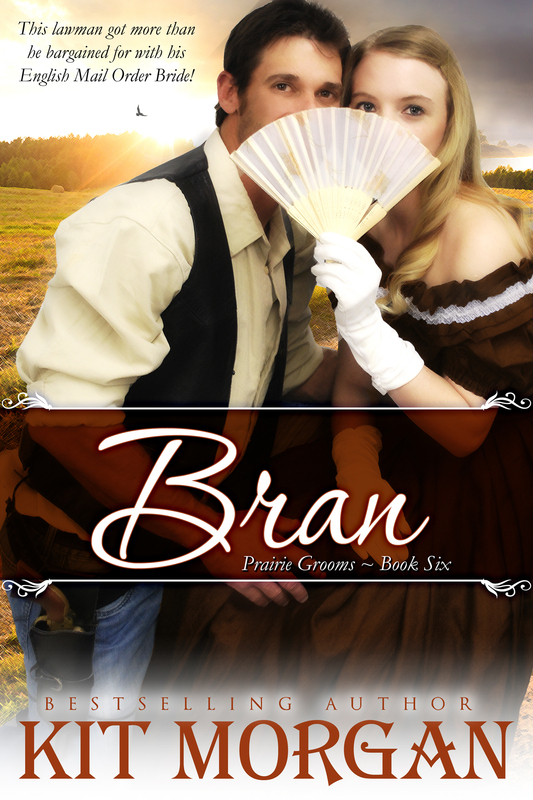 She was his mail-order bride, but was that fact enough to make her want to marry him if she ever discovered his past? What happens when three more English ladies are shipped off halfway across the world as mail order brides? EVERYTHING! Three sisters, Lena, Fina and Apple go from an even more posh lifestyle than their cousins before them, and arrive in Clear Creek, a nothing of a town full of quirky characters, crazy live-stock, and bumbling villains! Escorted by their strict and very proper distant cousin, Imogene, the girls have a hard time adjusting to life on the prairie (and they’ve only just arrived!). What’s to become of them? What if they can’t live up to their intended’s expectations? Lena worries most of all and is the first to wed. How will she please her husband when she can’t so much as boil water? Chase Adams has lived in Clear Creek a little over two years and doesn’t plan on going back to San Francisco, a city of regrets. 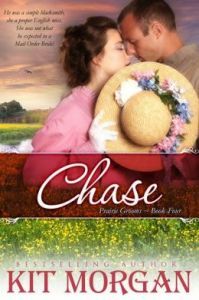 His father moved Chase and his mother there after he struck gold, and all that new wealth went to his head. He didn’t like money after that, and got as far from it and the evils that went with it, as he could. No one knew his past, and he kept it that way, by being alone. But soon that loneliness took its toll, so he had Sadie Cooke get him a mail-order bride. But then, what shows up? Three high-bred English ladies, that’s what! None of which knew how to survive prairie life. But that didn’t matter. What did was his heart. Was the English Miss Sadie ordered up to the task of caring for it? Levi Stone came to Clear Creek at the request of Cyrus Van Cleet. He came because he was fed up with his life in Boston, and wanted something better than what the stuffy high-society folks had to offer. 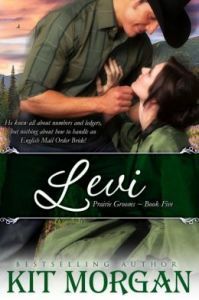 Cyrus told Levi he could find true freedom in Clear Creek, and he did. He found everything he wanted, except a wife to share it with. 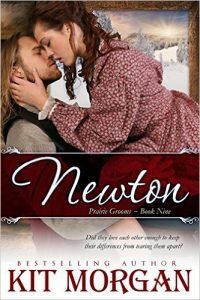 Felicina Sayer had always considered herself an even-tempered, peaceful sort, until she met Levi Stone, that is. For some reason, he brought out a side of her she hardly knew existed, and it scared her. Unfortunately, there was nothing she could do about it. They were married. Worse still, she didn’t know him well enough to know how to fight back! He even made a game of it! Would these two combatants find something in each other to love? Or would they drive each other crazy first? 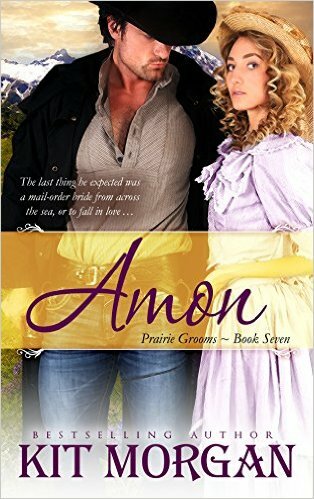 Find out in this fifth installment of the Prairie Grooms Series. Clear Creek was a quaint little place, one most men took one look at, and decided to settle. There was only one problem. There were no women. In fact, the town was so small, when women looked at it, they laughed then whipped their horses into a frenzy to get as far from it as possible. This of course, left a mighty big hole in the hearts of the men who lived there.Duncan Cooke, aka The Duke of Stantham, also had a problem. Six unwed cousins, women no man would touch for fear of losing either a limb, or worse. Strange things happened to all who tried to court them, so they were left very unwed.But Duncan realized that Clear Creek had exactly what he needed. Men! And so with the help of his brother’s wife Sadie, he concocted a plan to send his cousins to Clear Creek as mail order brides! 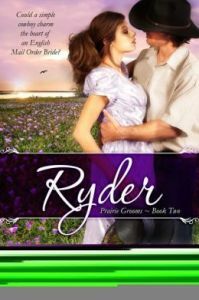 He just hoped the calamity that often followed them, didn’t find its way across the sea as well …Apple Sayer, the youngest of the Sayer cousins sent to America as a Mail-Order Bride, got a surprise. Her intended had been shot before she ever met him, and now she’d have to find a new husband. But that was easier said than done, as Apple believed in the dreaded Sayer Curse! In fact, it was already at work! The moment she locked Deputy Bran O’Hare in the bank safe, after thinking he was an outlaw. Only, he wasn’t, and now, he was out. Worse, he wanted to court her. What ever was Apple to do? Everyone deserves someone, even if that someone is a little … odd. Amon Cotter came to Clear Creek to help build Mr. Van Cleet’s hotel. His passion for his work may have been a little over the top, but his craftsmanship with wood was second to none, and when the hotel work was done, he decided to stay on.Nettie Whitman, the daughter of the nefarious Thackary Holmes, was sent from England to Clear Creek to find a husband. Accompanied by her twin brother, Newton, she is at the matchmaking mercy of the Cooke family, who think Amon the perfect match. But Amon has a mind of his own, and isn’t as interested in marriage as one might think. Until things start to happen that change his mind and heart. Can this mismatched pair make a go of it? Or are they too different? 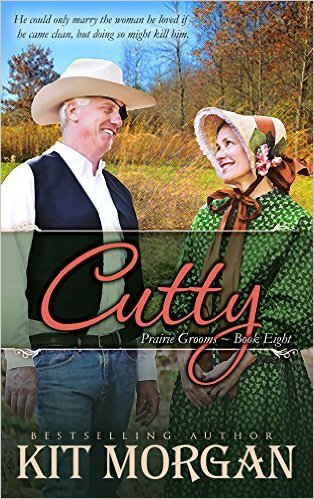 Add to the mix Cutty, the drifter, an identity created by a redeemed Thackary, who winds up as the pair’s chaperone, and you have the perfect recipe for … well, you decide. Thackary Cuthbert Holmes prided himself on being a dastardly rake, a man not to be trifled with, and smarter than your average under-handed thieving villain. But then he came to America. Clear Creek, Oregon to be exact, where everything Thackary had ever known, changed. Over the next several years he was stripped of everything and every one, sinking so low he opened his arms to embrace his own death. But that wasn’t about to happen, not if the good people of Clear Creek had anything to say about it. For all the bad Thackary did, disguised as the drifter Cutty, he did almost nothing but good. So much that even the “almosts” had to give way to the good man he’d become. But when it came time to reveal who he was to not only his newly discovered children, but the whole town as well, he didn’t know what to do. 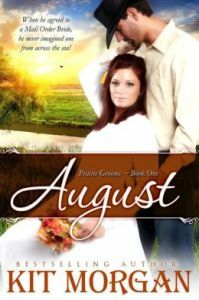 If he kept his mouth shut, he’d never marry Imogene, the one woman who loved him for who he was at his core. If he told everyone, he risked losing everything, including his life. What will Cutty do? Newton Whitman had a hunger for adventure and got more than his fair share after coming to Clear Creek, Oregon with his twin sister Nettie. Now that she was married, what was he to do? Fulfill his dream of exploring, what else? But throw his long lost father (a notorious rake) into the mix and now he’s torn. And in a very short time, he not only finds himself torn, but married as well! How did THAT happen? Newton’s not quite sure himself. All he knows is he’s in love and that he must do whatever it takes to protect his new bride. But how can he protect her from circumstances that might lead him straight to poverty? He’d had enough of that in England. But lack has a way of beating a man down and reminding him of how worthless he can be. Let him fight a man, an Indian, a wild animal, anything but a lack of means to provide for his new wife. But what choice does he have? He’s no longer a man alone. Throw in the fact his wife speaks hardly a word of English and now the whole town is involved. Raised by an unusual tribe of Indians, his new bride Arya has a lot to learn. They both do. The question is, will their differences in language and other things let them? Not to mention Newton’s pride? Circumstances, a couple of visitors, and a mysterious Scot will decide.